Start date: Thursday, September 27 2018. 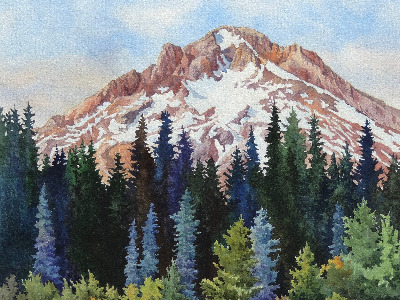 The instructional focus of this workshop will be about watercolor techniques for creating subjects in landscape painting. The class will do many exercises using subjects such as vegetation, trees, water, mountains and rocks. However, a constant theme in the class is the use of texture, value, color, and shapes to make a more interesting composition. Bring lots of paper. The first day, or more, will have a lot of activities to practice making trees, vegetation, rocks, water, and other subjects requested by the class. These activities will provide a chance to divide shapes, define shape edges, and use a variety of color, texture, and values. Handouts will include many ideas of how to use basic design concepts to enhance the finished painting. The workshop will emphasize a few of these ideas but we will explore many more possibilities that each person may choose to include in class projects. Photos and examples will be provided for each activity. Requirements: This is an intermediate level class, some exposure to and knowledge of watercolor painting is beneficial.